On Saturday 24 November, The Weaver’s House will be running something a little different… get ready for Christmas with a crafty workshop! 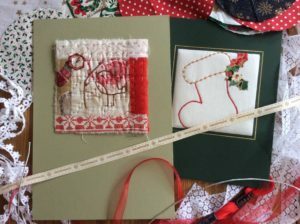 Three experienced tutors will be running workshops in different techniques to make seasonally inspired crafts. An opportunity to make something lovely for yourself or as a gift. A total of six different workshops are available across morning and afternoon slots, each one is two hours long and includes all materials plus tea, coffee and cake. Jane Cobbett is a textile tutor who has a passion for patchwork and traditional hand embroidery. She recently brought a thought-provoking textiles exhibition to The Weaver’s House, entitled War and Pieced. 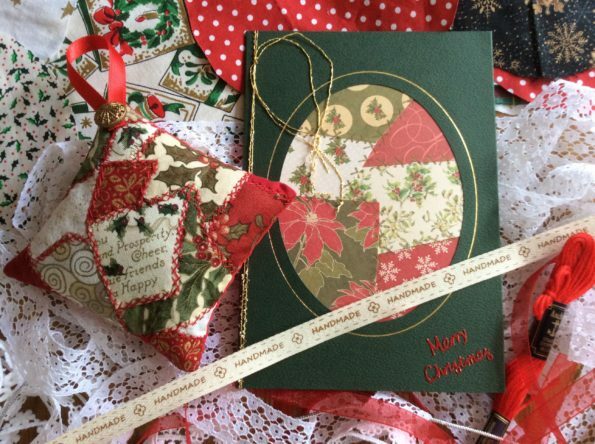 During the morning craft workshop session, Jane will show you how to make a Crazy Patchwork Christmas Tree Decoration incorporating pretty fabrics, embroidery and vintage embellishments. For her afternoon offering, she will be doing Redwork Embroidery to make a charming mini seasonal decoration with a cute Robin motif. Explore more about her work here. Kellie Sweeney loves vintage fabrics and uses tiny little precious pieces in her projects. She is known online by the sobriquet Bobbin Wren, and you can see lots of her beautiful work at bobbinwren.co.uk. 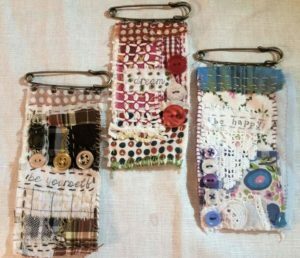 She will help you to create a Vintage Fabric Brooch using vintage fabrics, lace, ribbons and buttons (AM) or a Cuff Bracelet using reclaimed fabrics, vintage notions and easy sewing techniques (PM). 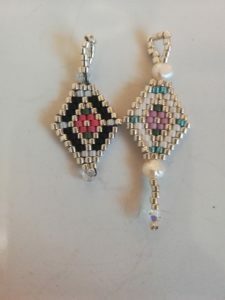 Sarah Strover is a keen crafter who loves to share her beading skills! She’s been working with beads since around 2005, and you may have spotted her stall at the annual craft fair Making Merry at the Herbert or Positive Images. 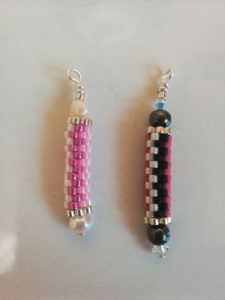 Here she brings a different take on weaving to The Weaver’s House with an Introduction to Bead Weaving to make stunning earrings or charms. In her afternoon session, she teaches basic brick stitch to create a striking geometric pendant. See more of her work here. Morning session from 10am until 12 noon. Crazy Patchwork Christmas Tree with Jane Cobbett. Vintage Fabric Brooch with Kellie Sweeney. Introduction to Bead Weaving with Sarah Strover. Afternoon session from 1pm until 3pm. Redwork Embroidery with Jane Cobbett. 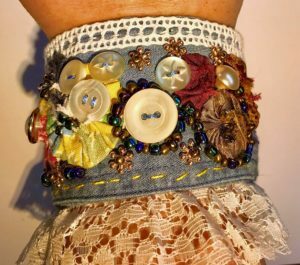 Fabric Cuff Bracelet with Kellie Sweeney. Geometric Pendant with Sarah Strover. Please select your choice of workshop when booking. Workshop ticket includes all materials plus tea, coffee and cake. Please make us aware of any dietary requirements at time of booking. Please note the workshops are for 18+ and must be booked in advance. Booking link for morning session. Booking link for afternoon session. The Weaver’s House is a historical site with some uneven floors and steps to some areas. 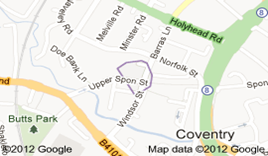 If you have any concerns about access, please do drop us a line via info@theweavershouse.org. You can also read more here. If you need to cancel your workshop booking, we require a minimum of 10 days’ notice in order for you to receive a refund (less a £2.50 administration fee). No refund can be given if less than 10 days’ notice is given. We are sorry, but sometimes we have to cancel a workshop due to circumstances beyond our control, if this happens we will give you as much warning as possible and refund your payment.